Many of us are still recovering from the recent Write 31 Days challenge, which takes place every October. 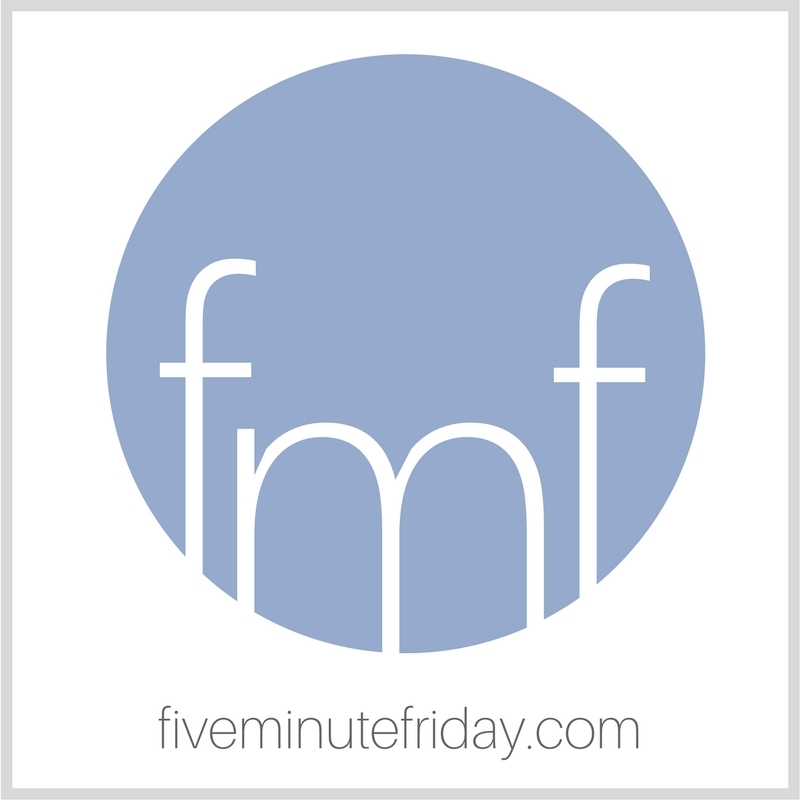 Here at Five Minute Friday, a number of us opted to tackle the challenge in five-minute free write chunks, using the 31 one-word prompts provided here. Some finished all 31 days within a single month, some are still chugging along, and others may have petered out partway through. A number of writers are now knee deep in the NaNoWriMo writing challenge — striving to write a 50,000 word novel in the month of November. If you’re considering the Write 31 Days challenge next October, or perhaps another writing challenge even before then, here is some great advice from two Write 31 Days finishers, Alice and Anita. Write 31 Days is an annual online writing challenge where you write every single day in October. I started doing this in 2013 and I’ve done it four times now, but 2017 is the first year I completed all 31 days. In the past, my shortest streak has been 2 days and the longest has been 24 days. This doesn’t make me an expert, but I thought I would share some ways to help you complete the challenge if you are considering Write 31 Days, and maybe even motivate myself in the coming years. Below are some timeline-related steps to prepare for the challenge, with PREPARE being the focus here. Preparation will give you great success in any challenge, and it’s true here as well. So let’s get started. Start thinking about the Write 31 Days writing challenge around July. In this phase, all you have to do is pick a topic that you can really stretch and write comfortably about for 31 days. When a topic comes to mind, see if you can list at least 15 days worth of post titles. If you can make that list and feel it can expand a bit more, then that’s your topic! A great topic would be some sort of list, like things you are thankful for each day or word prompts to pray on. This way, it’s a unified topic but you can diversify in the days. Now that you have a concrete topic in mind, start writing down the individual post titles or a rough headline for each day that you can expand upon later. Don’t go beyond the titles. The important thing in this step is to finalize the headlines for all 31 days. This is a very important step, because this will help you judge if you can justify your topic with 31 days of content. If you can’t or run out of ideas, then this is a good time to reevaluate your topic. That’s why we start so early! Look at your calendar for October and plan for the days you won’t be able to sit down and write. Write down the content for those days. You don’t have to get it all done and scheduled, but at least get the main idea out and leave the non-writing tasks for the day of the challenge. A good measure is to have a minimum of 10 posts prepared before the challenge to account for those birthdays, anniversaries, and God forbid, sick days. But make sure you don’t post all of them in the first 10 days. (I’ve done that 🙂 ) Save them for the days you know you won’t have the time. Start researching your topic. Depending on your topic, this step can come before or after you finalize the headlines. You might want to write down the headlines as you are doing your research or research based on the headlines you’ve written down. The idea is to have all research and headlines laid out on the table before the challenge even begins so when the day comes, you are not scrambling for ideas or stuck with dead ends. Trust me, I’ve been there. If you are planning to resource some posts from other bloggers, now would be a good time to communicate with them so they can start planning their posts. The Write 31 Days challenge requires you to create an image button for linking on their website, which is 100 x 100 pixels. This is a good time to create that image. Make sure the topic really pops out in that small image. Use their practice linky to see if it works and adjust the font size if needed. This is also the good time to create your own blog’s feature image, and set up your email list, social media announcements, and RSS feeds. Also prepare the introduction post that you will link on the Write 31 Days website. Publish the introduction post on your blog. Set an alarm for when the link-up opens so you don’t forget to link your topic, like I almost did this year! Relax and let those fingers type away the words. I hope these tips will help you in setting yourself up for success in the Write 31 Days writing challenge! Alice William blogs at Walking in the Word, where she encourages people in their walks with God. Read her Write 31 Days series on 31 Similes in the Bible here. You can also find her on Facebook, Instagram, and Twitter. Despite my good intentions to have the entire series written months in advance, I haven’t done it yet. What I have done is plan in advance. In June, I thought I had the perfect series topic, and so I wrote a rough daily outline and started the first post. It didn’t take. I took that to mean that the Holy Spirit didn’t want me to write about that first topic yet, so I put it on hold for another year. Lesson one: Pray about your topic and listen to the Holy Spirit’s promptings. In early September, whilst working on a project for school, I realized that maybe I should write about how to nurture oneself—after all, nurturing is part of my blog’s tagline. It took me twenty minutes to write up a rough draft of the intro and a rough schedule of posts. I connected with my favorite Facebook community (fellow Write 31 Days Survivors) for input on my button. The ideas clicked and within a week I had my button created as well as photos to use for graphics throughout the series and a general ‘feel’ for each post that would keep them tied together. Lesson two: Get your graphics and button done early. Next, I started writing posts. I knew I’d be gone a lot towards the end of September and in early October, so it was important to work ahead as much as possible. I started drafts of posts and plugged in the titles, graphics, keywords, and SEO information. With the housekeeping stuff out of the way, I knew I’d have more time to write (that housekeeping stuff seems to take almost as much time as the actual post writing). Lesson three: Do as much of the housekeeping stuff ahead as possible. By the time the first of October rolled around, I had the first seven days scheduled. A good thing, too, since I ended September with a six-day camping trip with 52 students, a weekend on duty (I work at a boarding school), and a special four-day STEM (Science Technology Engineering and Math) program that I coordinated the first week of October. After that, I had a conference out of state (which meant making sub plans—ugh) and a quick driving trip to Montana. Lesson four: It’s not cheating to write some of your posts before October. For the rest of the month, I woke up at 3:30am on weekdays and tried to write one and half posts each morning before everyone else got up. I always saved an open slot for Friday’s post, so I could base it on Kate’s Five Minute Friday prompt. As always, the prompts seemed inspired to fit in with my topic of the week in a beautiful, God-worked way. As the series progressed, my outline changed a bit. I intended to incorporate a few guest posts, but only got around to securing one—and it was so long I split it into two days. Lesson five: Set a specific time for writing and stick to your schedule. Anita Ojeda juggles writing with teaching high school English and history. When she’s not lurking in odd places looking for rare birds, you can find her camping with her kids, adventuring with her husband or mountain biking with her students. She blogs about caregiving at http://www.blessedbutstressed.com, and how to nurture yourself without indulging yourself at http://www.anitaojeda.com. You can chat with her on Twitter, find some of her nature photographs on Instagram, or check out her Facebook communities for caregivers or WordPress bloggers. What about you? What are your tips and tricks for surviving a writing challenge like Write 31 Days? It’s great to see how Alice maps out her strategy–I think great minds must think alike ;). I almost forgot to link up this year, too! Anita! So good to see your tips. I can resonate with almost all of them. Lesson 5 -> I wasn’t able to wake up at 3:30 am but I fell into a schedule unknowingly and that really helped and I expected myself to show up every day same time. Great tips from two of my faves! I was trying to figure out how you write your posts Anita. I was convinced you had to have written out your whole series in advance in order to keep up with the demands of your work. Wow! Getting up at 330 am! I’m impressed! It was a great series for sure? Even though the demands of writing each day wear me it, they also invigorate me! It’s a great distraction from a demanding job ;). I was a NaNoWriMo winner in 2015. My first and last attempt. Novembers are just too busy already for me. I thought about joining the October 31 days Challenge – But that was as far as I got… Thinking. It is a commitment. I did enjoy reading some of the series out there and found one I really enjoyed and looked forward to each days posting. I was a bit angsty on November 1 when nothing hit my in-box! – So thank you to all who do these challenges. You can impact others with your writing. I know… I was one of them! I’m impressed, Guy! I’ve only though about NaNoWriMo…maybe next year…if I get my #write31days series finished in September ;). Thank you for supporthing those who wrote! This is my third year of participating. I have only planned and written the introduction ahead of time. Last year I did the five minute words and a series. This year only a series. For me, I pay to have the image done for me. That really helps. But I write as the Lord leads on the day. I enjoy writing this way so all that is prepared is the word and the scripture. Alice, these tips are great! I love easy to remember break downs. Sharing!